I love to explore the culinary scene whenever I’m traveling, whether for work or fun. It’s why I do restaurant reviews and vacation recaps from time to time…I like to discover food in new places and then share it with others! After too many days of eating out, however, I start to crave being home and in my kitchen. Sometimes it’s because I’m inspired by something I ate in a restaurant that I want to recreate (like that pesto berry balsamic flatbread). Other times, it’s because I can’t stomach the thought of one more indulgent meal. A few weeks ago, I went straight from gorging on the best burger of my life in Minnesota to a business trip in Seattle where I finished an excellent meal at Dahlia Lounge with a giant slice of triple coconut cream pie, big enough to share but good enough not to (I didn’t). After a solid week of nothing but eating in restaurants with food prepared by others, I was more than ready for something a bit healthier. 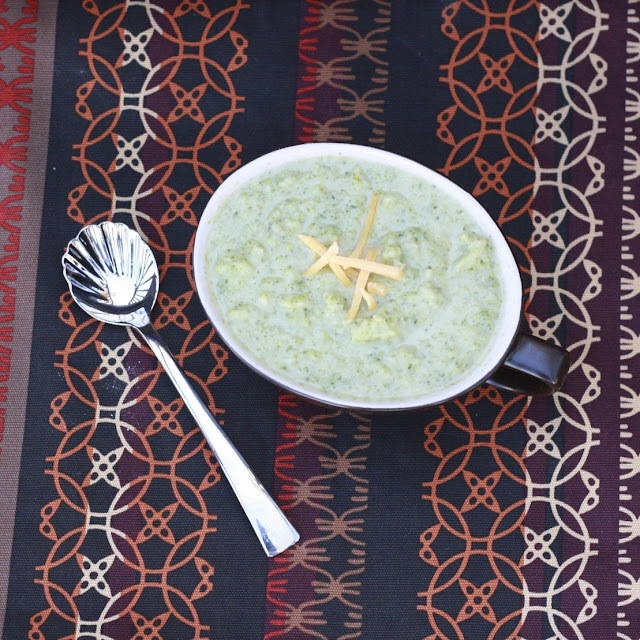 Thank goodness for Eating Well, a magazine whose tagline (“Where good taste meets good health”) rang true with this broccoli, cannellini bean, and cheddar soup. You’d never guess that the creaminess of this soup comes from pureed beans, not heavy cream or half and half. I pureed the whole batch of soup with my immersion blender, but if you like chunks of broccoli, set some of it aside after cooking it and add it after you puree the rest. This was healthy and comforting and exactly what I needed before setting out on my next travel/restaurant adventure! 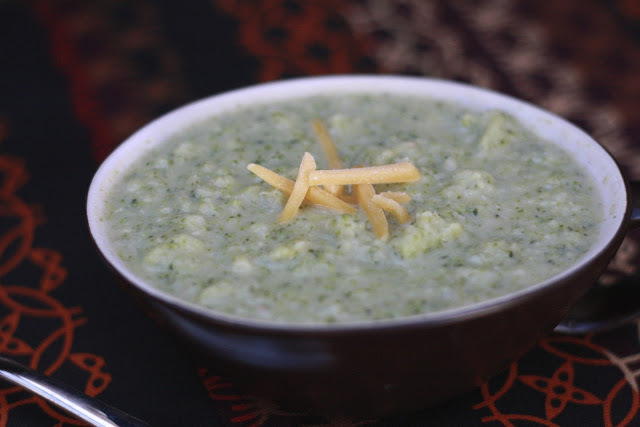 I’ve made broccoli cheddar soup before….check out another version here! 1. In a medium saucepan over high heat, bring water and broth to a boil. Add broccoli. Cover and cook until tender (approximately 8 minutes). 2. Stir in beans, salt, and pepper. Cook until beans are heated through, about 1 minute. 3. Transfer half of the mixture to a blender with half of the cheese and puree (or use an immersion blender and blend to desired texture). Serve warm.